I have sent him to you for this very purpose, so that you may know how we are, and so that he may encourage your hearts. I am sending him to you for this very reason, so that you may know how we are doing and that he may encourage your hearts. I have sent him to you for this very purpose, that you may know how we are faring and that he may comfort and cheer and encourage your hearts. I have sent [i.e., am sending] him to you for this very purpose, so that you can know our situation and that he can encourage your hearts. I sent him on purpose to acquaint you with my circumstances, and give you matter of comfort. 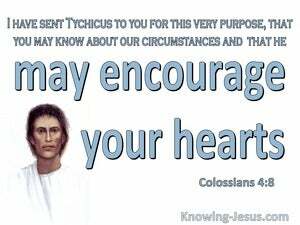 I am sending him to you for the express purpose of letting you know my circumstances, and of cheering your hearts. The reason why I am sending him to you is that he may ascertain how you are, and encourage your hearts. 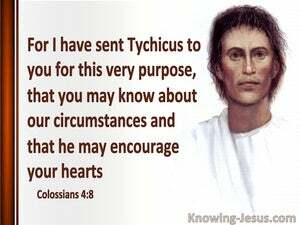 I have sent him with Onesimus, the faithful and beloved brother, one of your own number, for this very purpose, to let you know how I am, and to cheer your hearts. I sent him to you for this very purpose, that you may know how we are doing and that he may encourage your hearts. I send him to you expressly that you may learn our circumstances, and that he may give you encouragement. And for this very purpose I send him to you that you may know how we are faring; and that he may cheer your hearts. 7 All my state shall Tychicus declare to you, who is a beloved brother, and a faithful minister and fellow-servant in the Lord: 8 Whom I have sent to you for the same purpose, that he may know your state, and comfort your hearts; 9 With Onesimus, a faithful and beloved brother, who is one of you. They will make known to you all things which are done here. Whom I have sent to you for the same purpose, that ye may know our affairs, and that he may comfort your hearts. For this cause have I sent to you Timothy, who is my beloved son, and faithful in the Lord, who will bring you into remembrance of my ways which are in Christ, as I teach every where in every church. So that on the other hand, ye ought rather to forgive him, and comfort him, lest perhaps such one should be swallowed up with excessive sorrow. I sent him therefore the more speedily, that, when ye see him again, ye may rejoice, and that I may be the less sorrowful. For this cause, when I could no longer forbear, I sent to know your faith, lest by some means the tempter may have tempted you, and our labor be in vain. Wherefore, comfort one another with these words. Wherefore, comfort yourselves together, and edify one another, even as also ye do. Now we exhort you, brethren, warn them that are disorderly, comfort the feeble-minded, support the weak, be patient towards all men. Comfort your hearts, and establish you in every good word and work.